Lisa Beardow attributes her recovery from ovarian cancer to a "well-stocked toolbox": surgery and chemotherapy dealt with the tumours, while reflexology and massage, healing and counselling combined to "make me feel whole again". Lisa, who seems wise and deep beyond her years, lives with her partner Leo in South London. Just 32 when she was diagnosed five and a half years ago, Lisa was a carefree London career girl. A sales manager for a smart West End store she worked at the cutting edge of high fashion with top designers . Looking back, Lisa feels she was then quite a material girl with a passion for shoes and colour and clothes. She still loves beautiful things but now sees colour and beauty beyond the surface too. 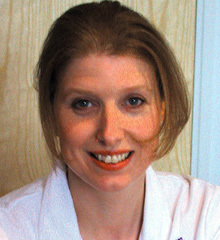 She also loves her two new jobs -as a qualified reflexologist and an administrator for Ovacome, the ovarian cancer charity. "Before I was diagnosed I didn’t even know that you could get cancer in the ovaries. Cancer simply hadn’t touched my life. I thought of myself as healthy except that I had very heavy and painful periods. Over the years I’d had four laparoscopies, from which it was deduced that I had endometriosis. I was given hormone drug treatment to suppress growth in the lining of the endometrium. There were then bad spells and better spells, but it’s amazing what the body can get used to. Knowing no different I didn’t think there was anything wrong with popping endless painkillers. And though it sounds odd, I’d been quite grateful to know I had endometriosis, because I no longer felt crazy and peculiar because I wasn’t like all my girlfriends on the Pill who had half a day’s bleeding a month and continued to swim 20 lengths in the pool. I went to my GP again when I began bleeding within my cycle and was suffering pain on ovulation as well as frequent urination and gastric pain. He sent me to St George’s who thought the endometriosis had flared up again and suggested a further Iaparoscopy in six months’ time. Not wanting to wait I was then referred to the Chelsea and Westminster Hospital where I was booked in for a Iaparoscopy within two weeks - and that’s when they found the cancer. It’s unusual in someone as young as I was - most people affected are 45 and upwards. No one has ever said whether the endometriosis developed into cancer or if it saved my life because it was the reason my condition came to light. Luckily it was caught early. My surgeon Jane Bridges was very kind and sympathetic; being a woman I think she understood my extreme shock and pain. She said that she knew how much I wanted to have a child and would do everything she could to save my uterus - which she did. Even so, I remember yelling like a small child ’No! No!’ and to this day I have no recollection of getting home on the bus, train or taxi. Maybe we block unbearable pain from memory because the operation on December 22nd - a terrible time for someone who finds Christmas childishly magical - felt very unreal. I look back on that time as very vague yet also vivid. I was confronting a threefold loss not only of my organs, but my sense of being a woman able to have children. I was catapulted into an early surgical menopause. Besides the physical pain, hot flushes and emotional loss, what I most remember about my hospital stay is the two women in my ward. We kept each other going, cried together on Christmas morning and shared a lot of chocolates. My six months of chemo felt increasingly difficult but I never gave up trust or once thought I was going to die. But like a small child I became terrified of needles. It’s amazing how the mind works. You can get yourself through the worst things like having poison dripped into your veins and then something small becomes a massive trauma that has you in floods of tears. Leo was brilliant through this period - and throughout. He’d come home from work at lunchtime bringing me choc ices and Iollies because I had mouth ulcers. My Mum also came down from Sheffield every other weekend. Together they influenced my recovery in a hugely positive way. I think it’s actually worse for loved ones looking in than it is for the patient, because they feel so powerless while you’ve actually got to get on with being put back together. I was also battling with HRT which I’ve had to take for my bones. I have to take progesterone as well as oestrogen and it really messes my system up. Inevitably I had very dark days when I’d just sob, but I tried not to block out the pain, just sit with it and breathe through it, because these are the cards you’ve been dealt and you just have to accept, pick them up and reshuffle. Even during chemo it was clear that I needed more than just physical healing because even though I functioned as a woman and looked like one, I didn’t feel like that inside. So I went to the Day Centre at Trinity Hospice for counselling, and to the Wandsworth Cancer Resource Centre for healing, massage, reflexology and counselling. The amalgamation of all this help plus a change of diet gradually put me back together again. Reflexology gave me back my wellbeing and I was so intrigued by the therapy that I decided to train myself. I’ve been in practice now for three years. I also saw a homeopath, Lynne Davies. Her Australian bush flower remedies work on the metaphysical form, on your emotions, helping to restore balance. My counsellor, Gill, was always there to support me through the grieving process. She let me be sad and listened to me in a way I don’t think many people had really listened before. In a very dark time she helped me see some kind of light and to live in the day instead of constantly projecting my thoughts on to a frightening future. When I was focussing on what I hadn’t got, Gill made me realise that I still had so much in my life. Being diagnosed took control away from every aspect of my life, but she helped me get some back. At the same time the charity Ovacome also became a significant part of my life: I could always phone and speak to someone who had been through a similar experience." The huge change process Lisa underwent affected even her working life: "Back at the store I remember looking down the sales floor and deciding: ’I don’t want to be here.’ If you’d asked me before the cancer I’d have said that I loved it and hated it, but looking back now I think I probably hated it more! I hadn’t a clue what I’d do next but I knew there must be more to life. I’m now a part-time reflexologist at The Vitality Centre in Wandsworth and last August I joined the Ovacome team as a part-time administrator and adviser to other women suffering from the same condition. Changing careers is absolutely the best thing that ever happened to me. I used to feel drained and exhausted after work, but now I feel so rewarded. I’m passionate about what I do; I’m my own boss and every day is different. Five years to the day that I was diagnosed with ovarian cancer. Leo and I cracked open a bottle of champagne at our favourite Cantonese restaurant. December 16 2002 means nothing to the world at large but to me it is such a precious anniversary. The benchmark I’d held in my head since year two had all of a sudden arrived."